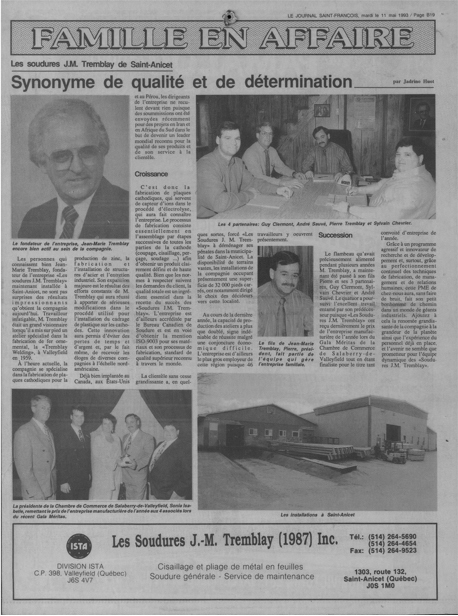 Groupe Tremblay Welding was founded by Mister Jean-Marie Tremblay in 1953. 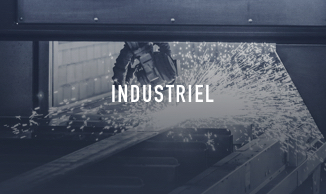 Throughout its modest beginnings, the company, then located in a small 450 square feet workshop, specialized in ornamental iron manufacturing. This era will forever be the inspiration of a constantly evolving business. Known for his work ethic, Mister Tremblay progressively attracted a larger clientele and grew his field of expertise. As a result, ten years later, in 1963, the company moved on Larocque Road, in Salaberry-de-Valleyfield, in a shop five times the size of the previous one. Conveniently located, business is then booming and the customer base expands consistently. Following a major customer’s request, a unique process was developed by the company, which now allows it to enter the market of manufacturing cathode plates used in the electrolytic process to refine zinc. The team’s ingenuity will then echo across the world, as the technology will be exported in North and South America, as well as in Europe. The company moved to Saint-Anicet, in over 12,000 square feet installations. With such spacious work spaces, a talented workforce and a great reputation, the enterprise’s expertise extended to the manufacturing and installation of steel structures, along with industrial maintenance services. Mister Pierre Tremblay succeeded to his father as head of operations, leading to an almost complete restructuring of the company. Over a ten-year period, the installations quadrupled in size and a considerable number of automated equipment was acquired. In 1997, Groupe Tremblay earned the bronze medal for SMEs, a prize given by the National Bank, and was accredited ISO 9002:94. 2012 brought about a whirlwind of change at Groupe Tremblay. A young and dynamic group of employees entered in a process of shareholding agreement with the president and vice-president, Mister Pierre Tremblay and Mister Guy Clermont. The current management team was thus created. Throughout its evolution, Groupe Tremblay never lost sight of its founding mission and values: cater to its clients’ needs, offer quality products and build on a skilled team that respect the company’s philosophy.